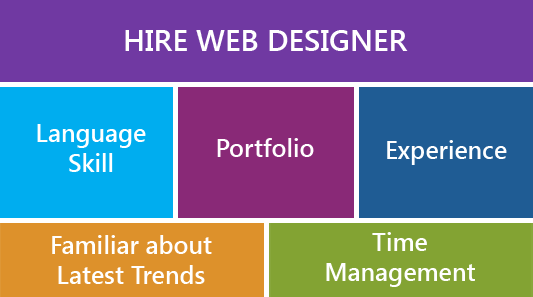 Hire a web designer is not an easy task, as it needs a great amount of homework and research. As we know there are many companies provide Hire services with eye-catching features however when you wish to assign web design task, you should have basic knowledge about your web designer. What skills your web designer has? How much experience does he carry? Are terms of hire company fits your requirements? All these questions must be verified and needs a proper consideration. In this article, we will focus on some inevitable skills of web designer on which whole impression of website depends. A professional web design not only induces visitors but also provide stunning look to your website. Your website appearance depends upon expertise of your web designer. Besides language skill, he must have knowledge of ongoing design trend, design sense, project management, time management, and custom-made solution, proper communication, etc. Let us discuss these qualities in depth. A single experienced designer is equal to 100 fresher. When you think of hire a web designer, you at least expect a well-experienced web designer so that you do not have to guide him at every point. A newbie could have bulk of creativity but at some point, he need some experience to process your web design smoothly. The more you have experience, the more you get profundity in web design. An experienced web designer know the in and out of web designing task and could give prompt result in time. A healthy communication is also a benefit of hiring an experienced web designer. Before hire a web designer, you should check portfolio of web designer company that shows working pattern and rich experience. On that base, you could easily ascertain the strength, reliability, fruitful work done by company. Sometime you can get design idea from portfolio and suggest your potential web designer about it that ease web designer task. Web designer should be aware of latest trend. To make a shiny website in current time, it is vital to implement latest graphic and animation in your website to catch visitor’s attention. If your web designer has knowledge of the latest trends then it will be easy and quick to carry out best-optimized web design solution to which customers really consider. Sparkly websites can drive more traffic to your website and it can be achieved by considering and implementing current web design trends. The success of whole web design project depends on time management. Web designer should have time bounding and must send regular report of finished task so that you can easily check progress of your assigned project. If your web designer does not consider the role of time management in his work, your design task may take longer time than you thought ever. Even you have option to choose the best service model for hiring a web designer that fits your project requirement like hourly base, full time, or dedicated web designer etc. A professional and devoted web designer can bring the finest result within given time limit.